As promised, I finally sat down and tallied up all our non-fixed spending for the last 12 months. Our “Year of Family” is acutally 14 months long, what with two summers and all, but as I wrapped up the reporting of our spending on the blog, I thought it would be nice to give an overall picture of how we spent our money. After tallying everything up, I don’t have that many revelations. We spent more than I hoped (by about $2,000), but way less than we did in the 12 months previous to this. 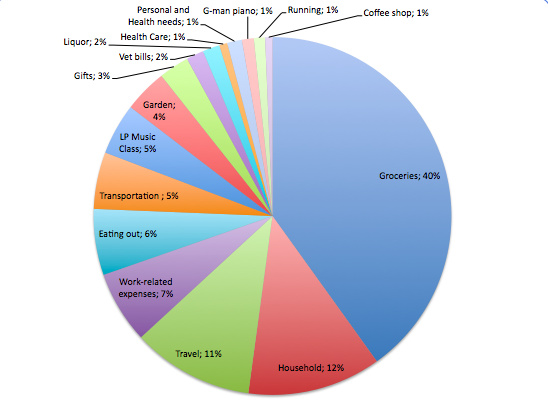 We budgeted $550 for groceries every month, but spent less than that for 10 out of 12 months. We spent about $800 eating out. That comes to about $70 a month. $70 a month could buy us two take-out Indain food dinners, five burrito meals, three visits to Veggie Galaxy for ice cream and fries, or thirteen trips for ice cream at our local ice cream shop. We spent 5% of our non-fixed budget on transportation, and that is without having to commute to a job. There is a lot I have realized in the last twelve months. I’ve realized that providing enriching experiences for my kids doesn’t have to break the bank (hello parks, libraries, and the local pond). I’ve learned that going out for treat now and again is usually worth the expense, especially if we forgo dinner out and replace it with a (vegan) milkshake and some fries. I’ve learned to look in the kitchen carefully before I go shopping, and use what I already have before I buy more “specialty” ingredients. I’ve learned that both my husband and I can drastically cut our spending if we just start writing down our expenses on the fridge. Most importantly I’ve learned that we can live within a budget that allows me to work part-time during these early years of my kids’ lives. Sure, I’ll have to put in a few more years as I get closer to retirement, but I’ll never get back the days of my daughter learning to walk, or the opportunity to volunteer at my son’s preschool. I’m super, super lucky to have that option, but it was really the work of my husband and myself this year that helped us realize what was really possible. So there it is! A year of spending*, and a transition to our new, more frugel, way of living. *not including the $30,000 we spent on housing, utilities, etc.